In Carolyn’s classroom, there are two kinds of kids at the end of the day: walkers and riders. In older grades the walkers actually walk home, but in kindergarten it just means that their parents pick them up. The riders ride the bus. Sometimes a walker will become a rider on a particular day, and sometimes a rider will become a walker. To switch from one to the other requires a note from a parent. For some reason, kids sometimes want to make the change on their own. 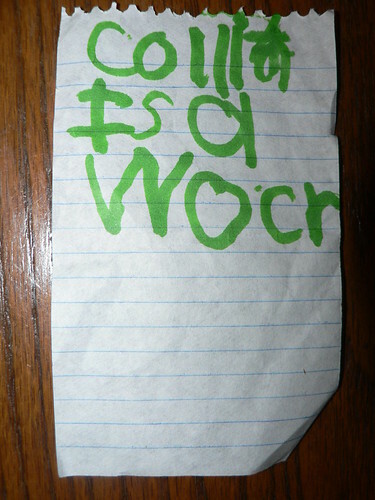 In case you can’t tell, the note says “Collin is a wocr” (“Collin is a walker”). Obviously Carolyn didn’t fall for it. But it did give her a good laugh. Cute! Little kid notes where they sound out the words are the BEST! Hmm.. after seeing the chicken scratch some men call printing, I would call the parents just to make sure. Hey Katie, that’s messed up–but funny! No need to bust on the guys just because we don’t write in bubbles like your half of the population.